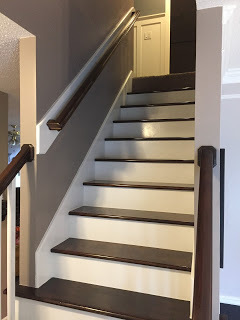 We are 4 years into a slow house remodel and the one thing that we continued to put on the back-burner was our stairs. 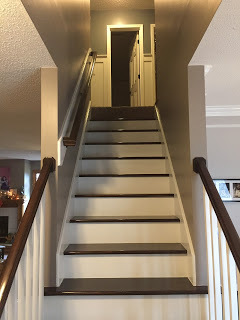 We finally came to a point where we couldn’t stand the eyesore they produced because they were front and center when guests walked in the front door. 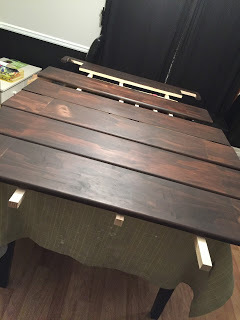 This was meant to be one of the weekend projects you see on Pinterest. 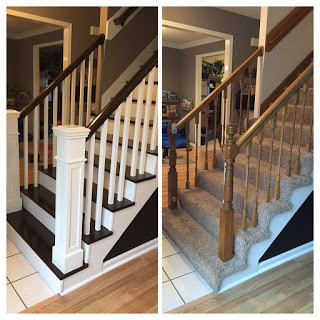 Remove the carpet, sand and stain the treads, paint the risers, replace the newel posts and balusters and call it a day. 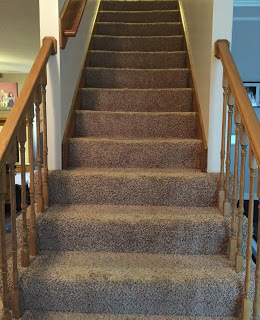 As we started to remove the carpet, we noticed that the stair treads were not one continuous piece but rather a 2×8 combined with a strip of 1×2. This along with the fact that the wood was some of the worst cuts I have ever seen, completely ruled out reusing them. 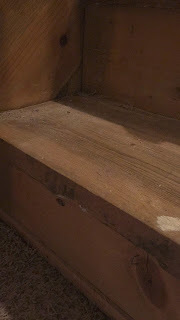 The risers were not in much better shape. Sure they were 1×6’s but there were huge gaps on the sides which proved to be too much to overcome. 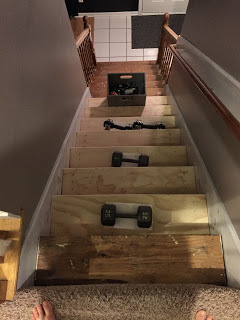 Our only choice at that point was to replace the treads with pine treads from Home Depot. 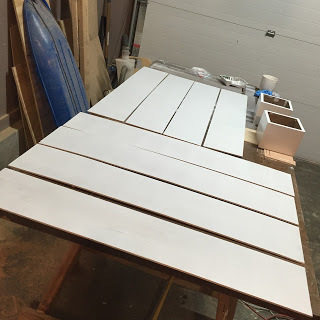 The risers were created using ripped down sheets of 5mm plywood. 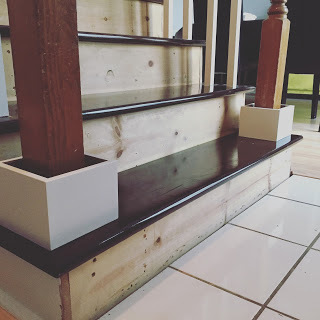 The top half of the stair treads were installed first and then stained and poly’ed. 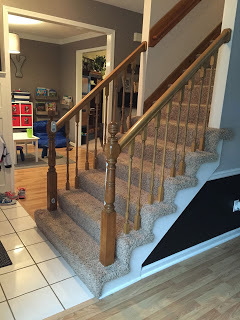 We were able to access to upstairs by doing an every other night process. 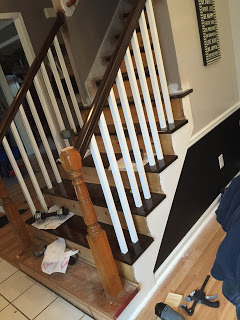 The lower half of the stairs were stained and poly’ed ahead of installation to make it easier. 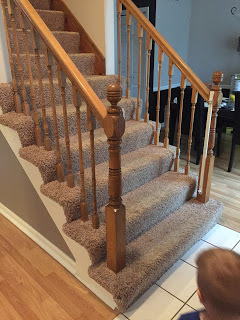 The main reason for this was so that I could replace the balusters at the same time as the treads and not have to worry about getting stain everywhere. 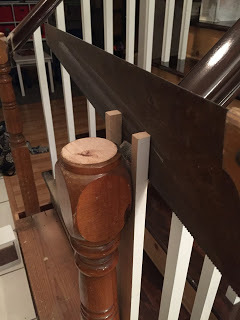 I created a jig to cut the rail with just enough space to slide the sleeve through and then secured with lag bolts. 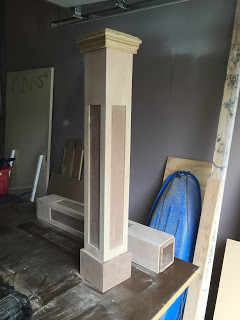 These bottom sleeves were left unattached so that I could raise or lower the main post to line up perfectly with the hand-rail. 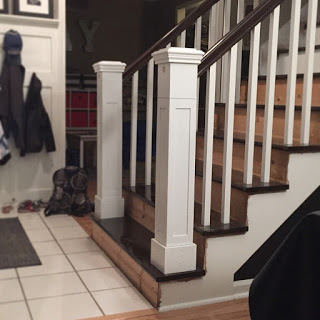 Once perfection was met, I nailed them to the main column. Here you can see the new posts and if you look close enough, you can see the brown plug that I used to cover the hole made by the lag bolts. 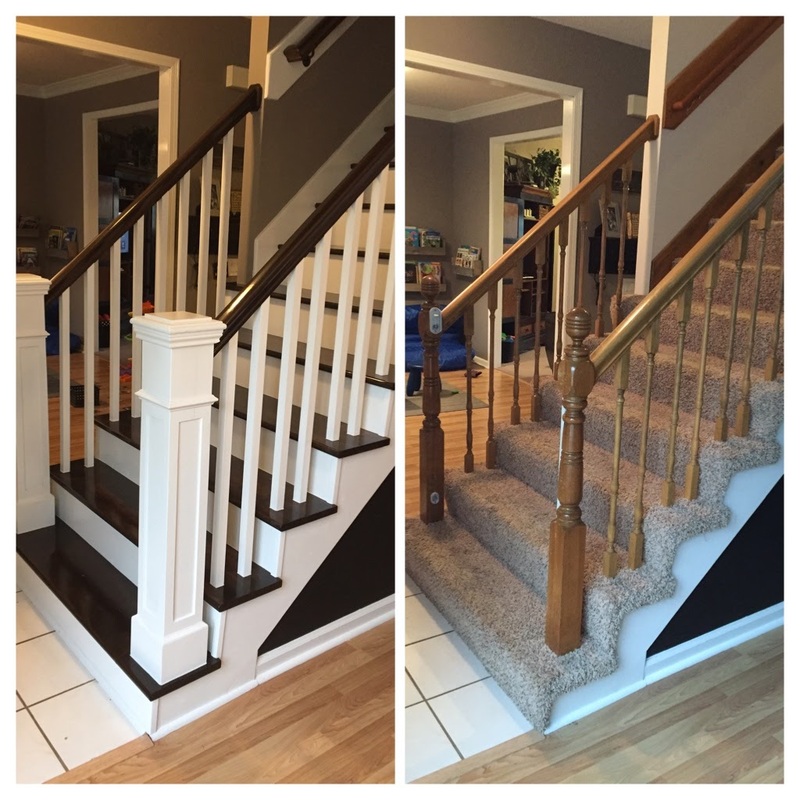 This project ended up taking a few months longer than anticipated but now that we are done we cannot be happier with the end results. 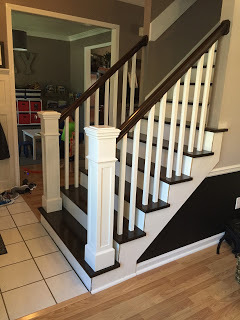 Next steps are to replace the flooring so that it matches with our new color scheme.